1 INGREDIENT RECIPE - AIR FRIED CRAB STICKS! 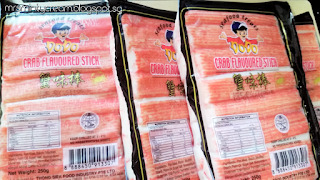 For the last couple of years, deep fried crab sticks has managed to make its way up the list of Chinese New Year goodies. In my opinion, this is such an easy item that we can all make in our home kitchen. It is totally not worth it to pay $15 for a bottle of such goodies. I rather spend that money on a bottle of pineapple tart or some extra bak kwa. Don't you agree with me? What's more, when you make it at home, you have the choice to either deep fry them or opt for a healthier version (which was what I did) by air-frying them. These are super easy to make and although Chinese New Year is almost over, I have been making more batches of these over the last few weeks to give away to friends, for them to have it as snacks. These are totally addictive and I shall be replenishing the stock I have at home again so that I can enjoy them anytime of the year, not only Chinese New Year. I may be wrong, but somehow, I am under the impression that consuming these goodies should be better than those high sodium chips or high sugary stuff. Isn't it? Another reason why I prefer the homemade version of these crab sticks is how they are crunchier and less oily when we make it at home. 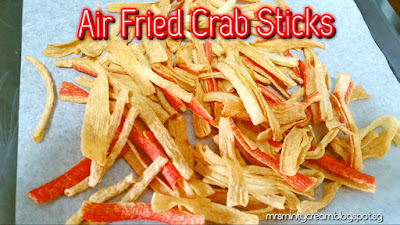 If you are like me, opt for air-frying the crab sticks instead of deep frying them. That really save me a lot of trouble. Easier preparation, easier cleaning up, equally crispy and fragrant treats at the end of the day. If you would like to, you may even sprinkle the crab sticks (before air-frying) with some sesame oil, paprika powder, curry powder or any other seasoning of your choice. I however, prefer the original version. Try it! Recipe: Adapted & modified from Noob Cook Easy Recipes. 1. Preheat air fryer to 160C for 5 minutes. 2. 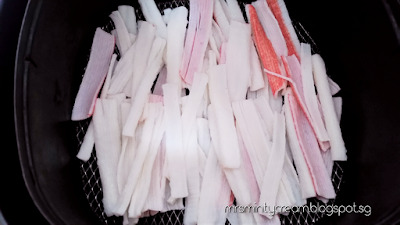 Prepare the crab sticks by removing the plastic sheet and unrolling the crab sticks. 3. Separate the crab sticks into 1.5cm width each (try to keep to the same width if possible to ensure even frying) and set aside. 4. When air fryer is ready, place the crab sticks ( I do half a packet, 8 sticks, at a time) in the air fryer. You do not have to arrange the crab sticks neatly because you want them to be spread out randomly so that they will not stick together. 5. Air fry them at 160C for 15 to 18 minutes until they are golden brown. 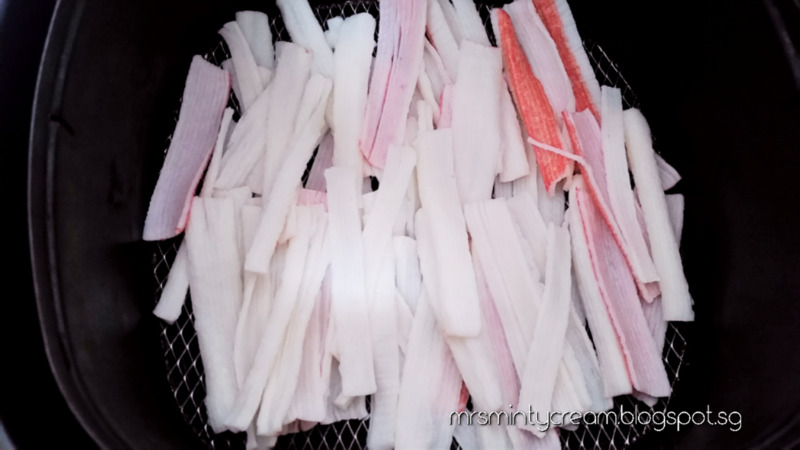 During the frying, it is important to pull out the basket of crab sticks in the air fryer and toss them using a pair of tongs (or shake the content in the basket) to ensure the crab sticks do not stick together and they may be evenly cooked. 6. Cool completely before storing them in air tight containers. Yes, they are really yummy and addictive just like chips. I love them! I have been thinking of getting myself an air fryer as I need healthier snacks like this one. Wow I'm intrigued by this air fryer! The finished crab sticks look so professional! Thanks dear! Its all thanks to my trusted air fryer that I get to enjoy such treats! I am so intrigued! They look perfectly crisp and yummy! You are totally right Jacqueline! They stay crispy and fragrant for days!! Ooh! This has to be yummy and healthier too! Sara, that's what I have been telling myself.. They are healthy (eat more), they are healthy (eat even more)…. Haha! Interesting about the air fryer. I will have to look into this. Looks great. You totally should Mica! Get one and share with us your version of healthier snacks and yummies! This must taste so good and its healthy! Thanks for sharing, I guess I need an air fryer! You are most welcome. I need you should get one too! I am curious about air fryer. Does it work with every food that can be fried? 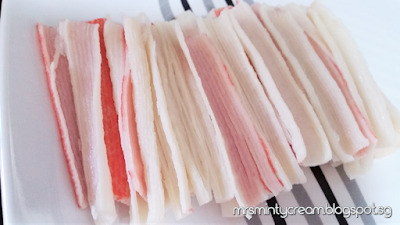 These crab sticks look really good. 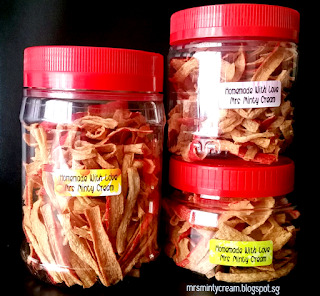 I love crunchy, savory snacks--chips are my favorite! These look right up my alley, but I've never even heard of an air fryer. Interesting! Same here! I just snacks like this! Oh, wow! I'm on another planet right now! 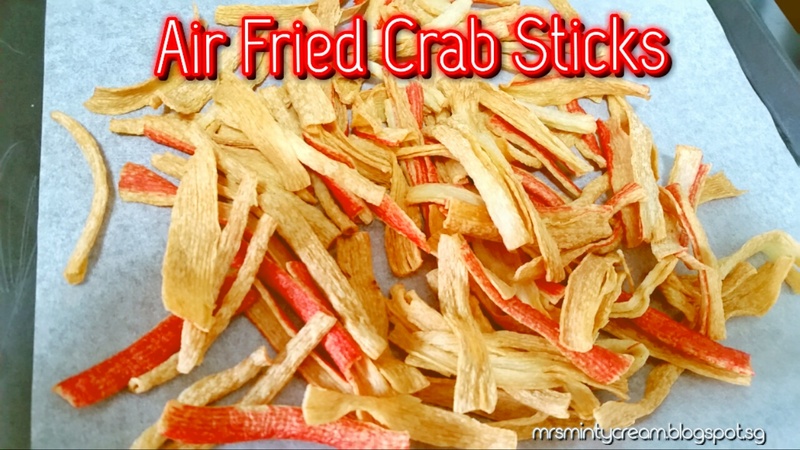 Never knew air fried crab sticks was a "thing" and you're using technology beyond the likes of my dutch oven and crock pot. Haha! I guess different kitchen gadgets rule different areas of the globe? This Air Fryer is good in the sense that it cuts down the amount of oil we use on our food. I love it! 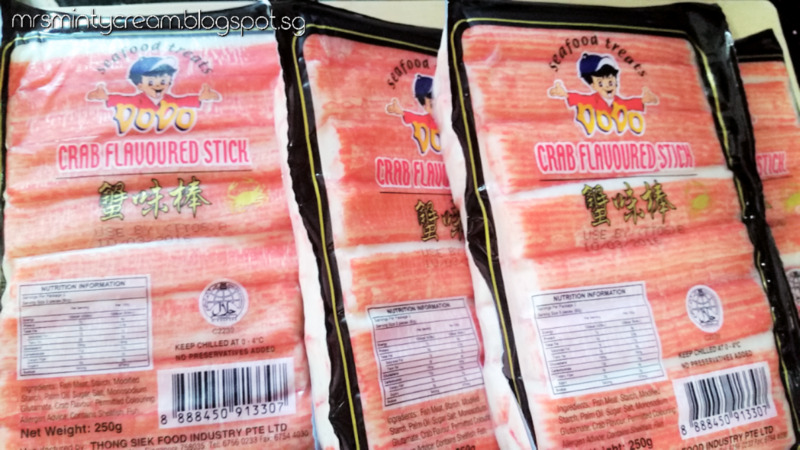 I've totally learnt something new here - I didn't realise crab sticks were a CNY thing. These look great, and I'm loving the healthier option. This recipe sounds delicious. The hubby wants me to make them this weekend! He does? Great! 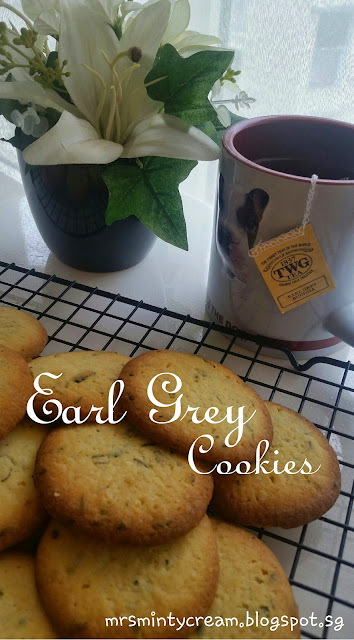 My hubby loves to have these over a mug of beer while watching television shows too. Haha!